La Vega, or Concepción de La Vega is the third largest city and municipality of the Dominican Republic. It is in La Vega Province. 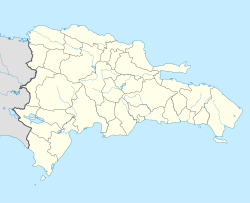 The city is known as the heart of the Dominican Republic for its geographical position and its large agricultural production methods throughout its province. Christopher Columbus built a small fort near present-day La Vega, in 1494, intended to guard the route to the interior gold deposits of the Cibao valley. A Spanish settlement known as Concepción de la Vega gradually grew up around the fort. After 1508, when gold was found in quantity there, Concepción became the first gold boomtown in the island. By 1510 it was one of the largest and most important European cities in the hemisphere. The town was destroyed and buried by an earthquake on December 2, 1562, and the survivors moved to the present site on the banks of the Camú River. The site of the ruined town remained largely farmland until a small part of the original city was bought by the Dominican government in the mid-1970s and renamed as National Park of Concepción de La Vega. The local industries are based upon cacao, coffee, tobacco, rice, and cattle production. There is also a small but very famous brewery called Cervecería Vegana known for its pilsener-style beers, named Quisqueya and Soberana. There is a factory known for making the famous sausage Induveca. La Vega is bounded on the north by the Camú River. This river flows about 100 kilometers before emptying into Yuna River. South of the city is the Cordillera Central, the largest mountain system of the Dominican Republic. El Ponton Field, a local airport, bounds the city on the east. To La Vega's west are the Camú River again and Montellano. There is an extension of the Universidad Nacional Pedro Henríquez Ureña and there is the Universidad Católica Tecnológica del Cibao. Since 2005 the national and local governments are planning to build an extension of the Universidad Autónoma de Santo Domingo, but there are some conflicts and the project is behind schedule. This city also has one of the most expensive schools in the country, the famous Colegio Agustiniano, which is the only in the country. Annually, the famous Feria del Libro de República Dominicana (Dominican Republic Book Fair) takes place in the city of La Vega. In this fair most of the famous books and literary works from Dominicans writers such as Juan Bosch, Joaquín Balaguer, w:es:Federico García Godoy, among others, and international writers such as Gabriela Mistral, Rubén Darío, Gabriel García Márquez, among others, are sold, and some theatrical works are shown to the public. The fair is celebrated each year in the month of September, lasting about one week, and brings to this city all the editors from all around the country, selling many kinds of books, theatrical works, etc. There are many bus companies which travel between La Vega other cities like: Santo Domingo, Santiago, Samana, Puerto Plata, and others. There is also El Ponton Field, which serves domestics flights. Each year between the months of October and December a basketball tournament is held in this city, it is called in Spanish Torneo Superior de Baloncesto de La Vega in English Superior Basketball Tournament of La Vega, This tournament started in October 1994 (after a time of political and cultural crisis between the years 1978 and October 1994). One team is still active, the other ("El Country Team") disappearing. El Parque Hostos is the most winning team with nine crowns (1995, 2001, 2002, 2004, 2005, 2006, 2007, 2009, 2013) and five times as runner up (1997,2003,2008, 2014, 2015). La Matica is the second most winning team with five crowns (1994, 1999, 2000, 2010, 2011), six times as first runner up (1998, 2002, 2004, 2005, 2006, 2007) and qualified to the finals in 1996 but that year's finale was eventually canceled. DOSA is the third most winning team with five crowns (1998, 2008, 2012, 2014, 2017) and four times as first runner up (2001, 2009, 2010, 2013). La Villa is the fourth most winning team with two crowns (1997, 2015) and five times as runner up (1994, 1999, 2000, 2011, 2016). Enriquillo is the fifth most winning team with two crowns (2003, 2016), one two as first runner up (2012,2017) and qualified to the finals in 1996 but that year's finale was eventually canceled. In the tournament number 19 (2012) was the first time in the history of this tournament that none of the most winning teams Club La Matica & Club Parque Hostos didn't advance to the final. Edward Concepcion: professional baseball pitcher for the San Francisco Giants of Major League Baseball. Jonathan Villar: professional baseball shortstop for the Houston Astros of Major League Baseball. ^ a b Consejo Nacional de Población y Familia. "Estamaciones y Proyecciones de la Población Dominicana por Regiones, Provincias, Municipios y Distritos Municipales, 2014" (PDF) (in Spanish). Retrieved 2014-02-02. ^ "Expansión Urbana de las ciudades capitales de R.D. 1988-2010. Informe Básico" (PDF) (in Spanish). Oficina Nacional de Estadística. April 2015. p. 48. Retrieved 9 December 2016. ^ Floyd, Troy (1973). The Columbus Dynasty in the Caribbean, 1492-1526. Albuquerque: University of New Mexico Press. pp. 30, 57–58, 66. ^ "La Vega Climate Normals 1961-1990". National Oceanic and Atmospheric Administration. Retrieved September 15, 2016. This page was last edited on 19 November 2018, at 06:52 (UTC).